In the left panel of the WebSphere web console, expand Monitoring and Tuning and select Performance Monitoring Infrastructure (PMI). Select a node, server, or cluster. By default, PMI is enabled in Basic mode. 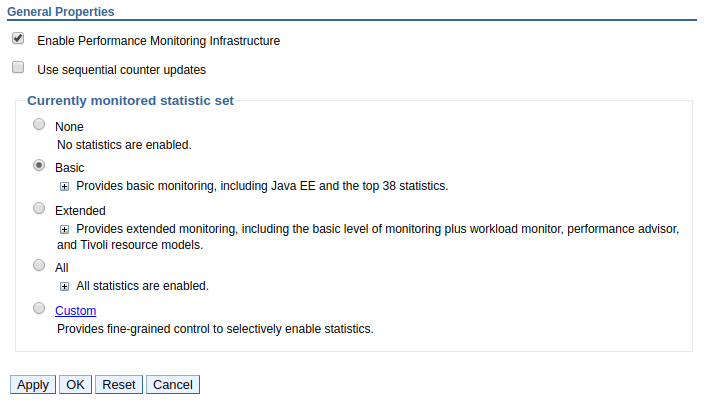 In the left panel of the WebSphere web console, expand Monitoring and Tuning > Performance Viewer, and select Current activity. Select a node, server, or cluster. This will display the Tivoli Performance Viewer. Select Start Logging to watch the collection of performance metrics in real time. In this example, the Snoop Servlet of the Default Application was refreshed twice to generate some monitoring data. 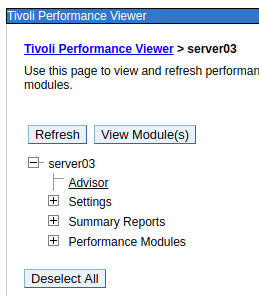 Tuning suggestions can be viewed by selecting Advisor in the Tivoli Performance Viewer. In this example, there are 5 tuning suggestions.